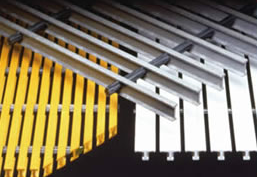 DURADEK® is a standard pultruded grating product stocked by distributors nationwide. It is available with individual bearing bars in either 1″ or 1-1/2″ “I” shapes or a 2″ “T” shape. DURADEK® is a flame retardant product utilizing a polyester or vinyl ester resin. 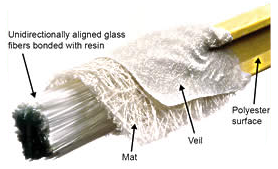 The bearing bars use both longitudinal (glass roving) and multidirectional (glass mat) reinforcements as well as a synthetic surfacing veil to provide unequaled corrosion resistance. Complete load tables and properties can be requested by contacting Redwood Plastics. The bearing bars are assembled into 12 panel sizes for your convenience; 3-, 4- and 5-foot widths in each of 8-, 10-, 12- and 20-foot lengths. Standard panels come with cross-rod spacings of 6″ or optional 12″ on center. The 3-piece cross-rod system is the best assembly method for pultruded grating in the fiberglass grating industry because it provides better stability than competitive crossrod systems. 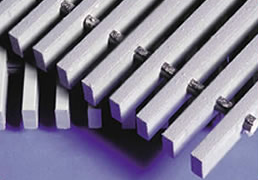 The three piece members in combination with a proprietary bonding method tie the bearing bars together and provide stability to the grating panel. Stork Materials Technology, an independent testing facility, tested our pultruded grating for tensile strength and impact strength after being subjected to ultraviolet (UV) radiation weathering. The independent testing was performed in accordance with ASTM D638 for tensile testing and ASTM D256 for Izod impact testing. 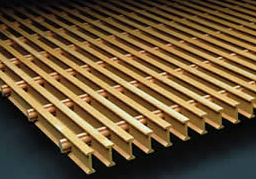 Cost Effective — Redwood’s pultruded grating is lightweight and, therefore, easily handled in installation, and cost less to ship than steel grating. NOTE: Fiberglass grating has been used in chlorinated, brominated, and salt water applications as well as many harsh outdoor exposure applications for many years. It has also been used (and is currently being used) in subsea applications. We are not aware of any product failures due to such water or ultraviolet radiation exposure for periods exceeding 20 years. If pool and spa fiberglass drains are properly maintained and not subjected to any abnormal use or damage, we therefore believe, but cannot guarantee, that the FRP grating should have a life expectancy of at least 20 years and likely much longer. Standard carpenter’s tools with abrasive cutting edges may be used; just coat the cut ends with resin sealer and install. 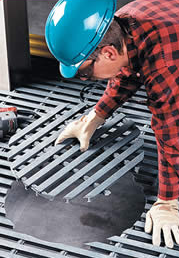 A detailed Field Fabrication Guide is available by contacting Redwood Plastics. A Decking Fasteners flyer is available that provides information on the preferred fasteners available for all decking products. Illustrations of the various fasteners and uses are exhibited on the back of the flyer.